Which is best - Greece or Turkey ??" A question we are frequently asked - and find it quite impossible to answer; except that BOTH are wonderful! So for those of you who equally well can't decide, there's always our combo trips; one week Greece, one week Turkey! It really is the "best of both worlds" - a chance to experience all the idiosyncrasies of our wonderful, white-washed little islands in the Dodecanese, and to meet our lively, outgoing Greek friends - and then the contrast of the greener, more subtle scenery of Turkey; the stunning, pine-forested anchorages and her quieter, but equally welcoming local people. We tend to run our combo trips early and late in the season; from mid April-mid July, then Sept-Oct. Turkey gets very hot and very crowded in the midsummer months, whereas our home islands in the Dodecanese (being very little known!) never get too packed out, and the summer meltemi makes sure that temperatures stay pleasantly cool on the water. We plan our Greece-Turkey combo trips to make the best of weather patterns here! May, June and early July are uncrowded and pleasant temperatures in both countries. Choose early May if you're not a big heat fan, love to hike around ruins, explore on the land, etc. Go for later if you love the sun, swimming and don't mind it hot in the afternoons! Midsummer tends to be very hot and somewhat crowded in SW Turkey, so we usually stay in further north in Greece during late July/August. 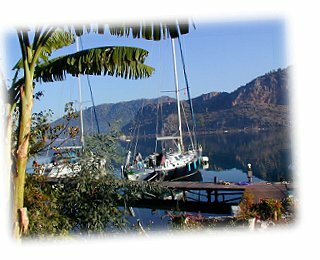 Mid Sept / Oct are the next scheduled "combo" trips; it's still lovely down in Turkey right until early Nov; wonderfully warm for swimming & sunbathing, yet not too hot for hiking/exploring. For private groups, we are able to put together a customised Greece-Turkey route pretty much any time you want - just drop us a line ! 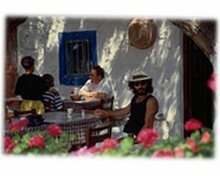 Our Greece-AND-Turkey trips sail to our favourite islands in the Dodecanese; from tiny fishing villages where the traditional Greek spontaneity and lively spirit lives on - to the bright lights and party nights of the more developed islands, where one can eat, drink and be merry in modern-day Greece! Our other favourite spots tend to be the quieter, less "touristy" parts of Turkey, where our local friends give us a real family welcome. We explore more ancient sites, luxuriate in Turkish baths - and even learn to belly-dance! Below is a map showing our usual cruising grounds for the "combo" trips - click on the place names to see more details! Or to plot your own course around the islands, visit our chart room . For trips starting in Leros, embarkation time is 10.30am on day 1. Disembarkation is 9am on day 7 for 6 day trips; 9am on day 10 for 9 day trips. 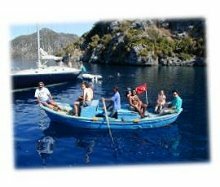 For trips starting in Bozburun/Datca, embarkation is 11am on day 1. disembarkation is 9am on day 7 for 6 day trips; 9am on day 10 for 9 day trips.